We enjoyed 10 days of beautiful weather, new food and adventures at the 2017 Kansas State Fair! Check out the recap of our bucket list below. The Nex-Tech Wireless Lake Talbott free stage had another great line-up this year. We saw a little bit of everything from rock to country and more! Tried a stuffed pretzel - this one had three cheeses, yum! Another year of excellent acts at the Nex-Tech Wireless Grandstand. New to Gottschalk park this year, Flippin', it was AWESOME! Enjoyed ice cream at the newly renovated KSU Dairy Bar. We found out where our milk (and ice cream) come from at the Milking Parlor. I tried a Jaffle! BBQ was my favorite, but chicken and veggies are available too. 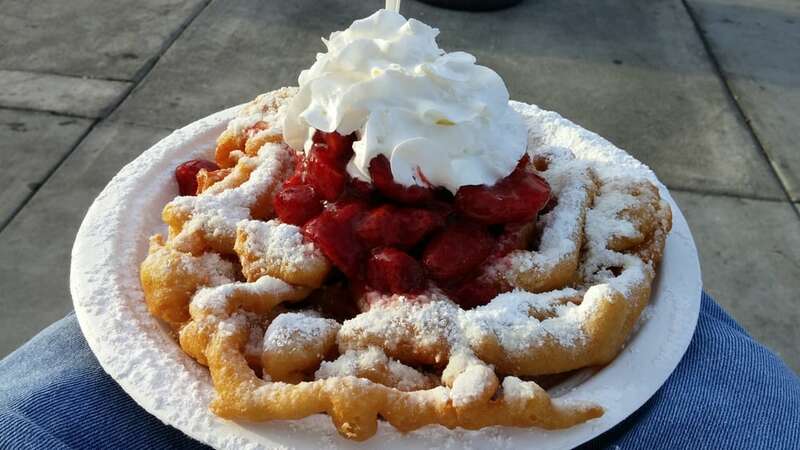 A fun twist on the funnel cake - a strawberry shortcake funnel cake! Yep, it was amazing. In our 3 years at the Kansas State Fair, we had never taken a spin on the Ferris Wheel! Have ideas for next year's bucket list? Share them with us on social media! We're thinking a hot beef sundae and a trip through the mobile escape room are a must for next year.